Dr.Leo Esaki invented a tunnel diode, which is also known as “Esaki diode” on behalf of its inventor. Its a high conductivity two terminal P-N junction diode doped heavily about 1000 times greater than a conventional junction diode. Because of heavy doping depletion layer width is reduced to an extremely small value of 1/10000 m. Reverse breakdown voltage is also reduced to very small value~0 resulting in appearance of the diode to be broken for any reverse voltage and a negetive resistance section is produced in the volt-ampere characteristics of the diode. What is tunneling in a tunnel diode? Through the reduced depletion layer,it can result in careers “punching through” the junction with velocity of light,even when they have no energy to cross potential barrier. As a result a large forward current is produced at relatively low forward voltage(<100mv). Such a mechanism of conduction in which charge carriers punch through the junction is “tunneling”. Because of heavy doping a tunnel diode cam conduct in both directions but it is usually used for forward conduction only. Tunnel diodes are usually fabricated from germanium,gallium arsenide, or gallium antimonide. Silicon is not used in the construction of tunnel diode becuase Ip/Iv is maximum in case of Gallium arsenide. 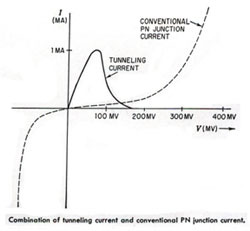 (Ip=Peak value of forward current and Iv= Valley current). This ratio is very small for silicon and is of the order of 3. Ordinarily they are manufatured by alloying from gallium arsenide. Source materials are highly doped semiconductor crystals with an impurity concentration of the order 10^25 per cubic meter. Note: Being a low power device a tunnel diode can be damaged easily by heat and static electricity. Why Silicon is not used in the construction of TUNNEL DIODE ? If you want to get know more information about Tunnel Diode visit our site, there are more information about this diode. Respected sir : what does it mean punching through in tunnel diode ? I need the explanation of tht charactrstics of tunnel diodes i.e. why the valley formation ossurs?